The following tips should help you save money by reducing the total cost of printing on Inkjet, Bubblejet or Laser printers. The tips apply to color printers as well as black-n-white printers. Before moving to the tips, here's some advice for people who are yet to make a decision between an Inkjet and a Laser Printer. Generally, the price of Inkjet printers is less than the price of Laserjet printer but in the long run, Inkjet printers prove a bigger burden to your pocket as the cost of toner cartridges is very high. My suggestion would be to take the Laser option if you plan to print more than 8-10 documents per day. With Laser printers, the cost of ink consumed is much less, and the print speed as well the print quality is much better. 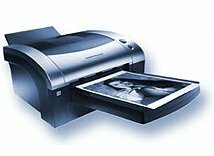 However, if you are on a budget and need to take prints of your colored digital images, a Inkjet printer would be more suitable. Option 1: Most web pages have a "Print This Page" link that reformats the current webpage by removing all the banner ads, graphics, etc. Else save the webpage as text and then print the text file by opening it in Notepad. Option 2: If the above option is not available, you may still select the portions with your mouse that you want to print and paste them in Notepad or Microsoft word. You'll save on paper as well as ink. Option 3: This is my favorite trick - Get the Aardvark Firefox Extension. It is the best way to remove or hide any object from a webpage including HTML tables, div elements and images. Start Aardvark, hover the mouse over webpage areas that you don't want to print and press E (erase). Highly recommended. Option 4: This is for geeks who are aware of HTML. Save the current webpages as HTML on your hard-drive, open that HTML file in Nvu, Dreamweaver or even Notepad and delete the HTML tags, content that you don't want to see in the printed document. Once you have cleaned up, open the file in IE or Firefox and print from there. For Powerpoint: Print Handout and not slides. Use Grayscale or B&W mode rather than the default Color mode. For Excel: Instead of printing full spreadsheets or the entire active spreadsheet page, select the areas (or cells) that you want to print and choose "Print Selection". Reduce the print quality (dpi) from the Page setup window and also deselect the option to Print Gridlines. If possible, use the Draft Quality mode. For Word: Click "Options" button in the Print window and choose "Draft output" in the Printing options. Specify the page numbers that you want to print instead of printing the entire document. That will save your printing time, paper as well as ink. Printing colored pictures on a home computer consumes the maximum amount of ink. For many inkjet printers, printing a color photo can use as much as 30 times more ink than printing a standard page of text. The best bet is that you take the digital camera to the nearest photograph printing lab rather than print those jpg files at home. That may actually cost cheaper than printing on your personal printer. If you still want to print images at home, get a good photo editing software like Photoshop or Gimp or even Paint.NET. Resize and Crop the picture to make it look more interesting. For best results, use photo paper recommended by the printer manufacturer as non-standard quality paper may jam the printer rollers or may even repel ink. I personally prefer a photopaper with a Matte finish than a glossy paper. If you print too many digital photos at home, consider investing in a dedicated Color Photo Printer. Most inkjet printers have three print quality modes: best, normal, and draft but many printers use almost the same amount of ink when printing in best and normal modes. The main advantage to normal mode is that the page is printed more quickly. Draft mode, however, will significantly reduce your ink consumption. The tradeoff to using draft mode is that you often get results with very poor print quality. For inkjet users, I would highly recommend Ink Saver 2.0, a amazing printer addon that gives you more control over the Print Job and significantly reduces the overall cost of printing while mainting the print quality. Before setting up, you can print a sample InkSaver page that illustrates how documents will look when printed at various ink reduction settings. You can choose ink savings from 0 to 75%.